Directions to Capitol Realty Group, Inc.
Take the MBTA's RED Line to the Charles/MGH station and use the Charles St. exit. Capitol Realty is on the right side of the street 2½ blocks up at 80 Charles St., 2nd floor. From I-93 South, take Exit 26A towards Cambridge. Keep left at the fork in the ramp towards Storrow Drive. Merge onto Storrow Drive and take the ramp toward Government Center. Go straight off the ramp onto Charles St. Capitol Realty is 2½ blocks up on your right at 80 Charles St., 2nd floor. Take the Mass Pike to exit 18 towards Cambridge/Somerville. Take a right onto Soldiers Field Rd. which becomes Storrow Drive. Follow Storrow Drive past the Arlington St. exit and through the underpass. After you come out of the underpass, take a right at the second intersection, Revere St. Take a right at the next light onto Charles St. Capitol Realty is 1½ blocks up on your right at 80 Charles St., 2nd floor. From I-93 North, take Exit 12 towards Braintree/Boston. Merge on US-1 N which becomes MA-3 N. Take the RT-3 N Exit 26B towards Cambridge/Somerville. Keep RIGHT at the fork in the ramp. Merge onto Storrow Drive and take the ramp toward Government Center. 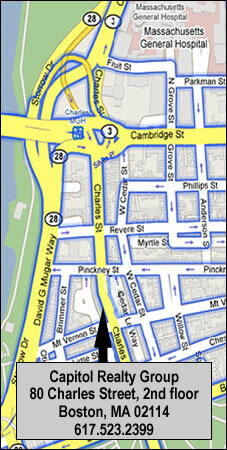 Go straight off the ramp onto Charles St. Capitol Realty is 2½ blocks up on your right at 80 Charles St., 2nd floor.